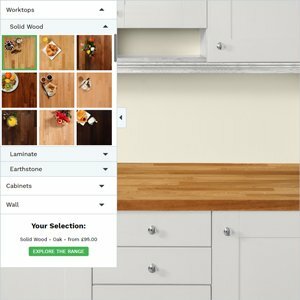 Our easy-to-use Online Bespoke Worktop Tool allows you to choose your worktop and add your alterations to it, providing a price for your laminate worktop customisation alongside a technical drawing showing how it will look when it is finished. Any fabrication services required can receive 10% off when ordering through this tool, offering a fantastic saving! 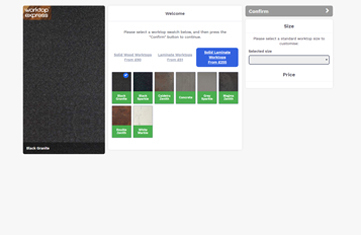 Please note: that all Online Bespoke Worktop Tool prices given on this page are inclusive of the ongoing10% discount for all services ordered online - find out more on our Current Offers page. 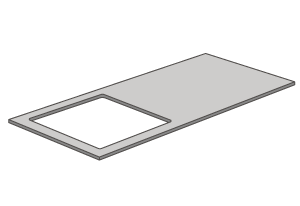 There are a number of reasons that worktops may require alterations prior to installation. 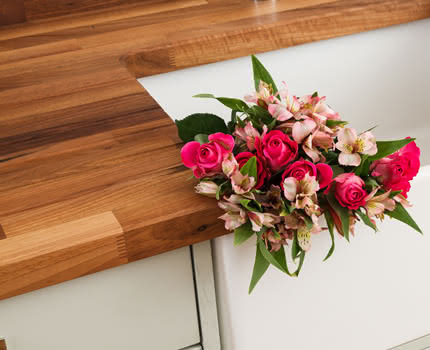 Order your solid laminate worktops cut-to-size to accommodate sinks, hobs, taps or the existing architectural features of your property using our bespoke worktop cutting service. 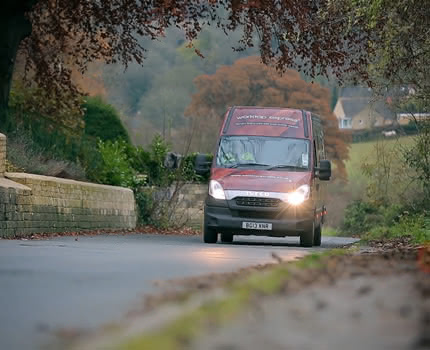 Our skilled fabrication team in our Gloucestershire location combine years of experience with the latest technology and machinery to ensure your solid laminate worktops are cut to your exacting specifications. 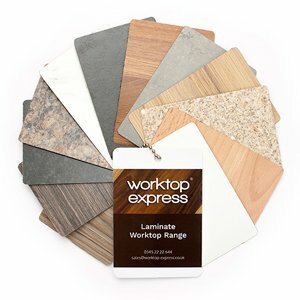 We offer a number of options for you to customise your solid laminate worktop to ensure it is ready to be installed upon arrival. 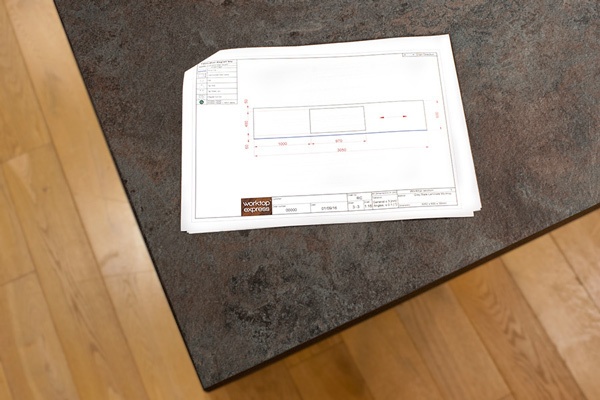 Once we have confirmation of your fabrication diagram, it will take 3 - 5 working days for us to create your worktop and deliver it to your address. 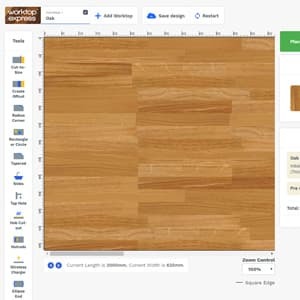 To order your bespoke solid laminate worktops, all you need to do is email our fabrication team at , or complete our contact form to request a quote. Any lead times we quote are from the point at which diagrams are confirmed and they are inclusive of delivery timescales. *The lead times quoted are from time of diagram confirmation. *Delivery to the Scottish highlands and islands may take longer. 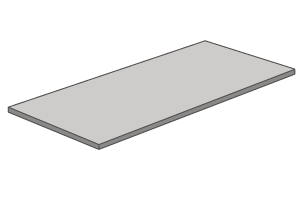 If you need your solid solid laminate worktop cut-to-size, we can cut your surface in a straight line across the length or width to meet your requirements. 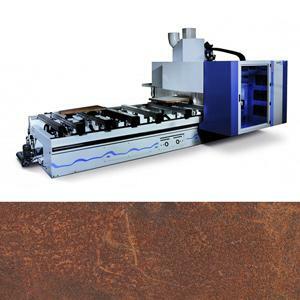 Our machinery will ensure a precise cut as it is serviced regularly to maintain the high standards of this service. Prices above are for first cut and charged at the discounted rate for multiple cuts. Once provided with the correct measurements, we are able to accurately cut an aperture for an overmounted sink. It is recommended that overmounted sinks are placed 150mm from joins in work surfaces and 40mm from the front edge of a worktop to ensure stability. Undermounted sinks are available in a variety of shapes and sizes. 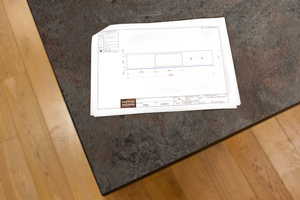 Provided with the correct measurements, we can cut an accurate space to accommodate a sink of any dimensions. 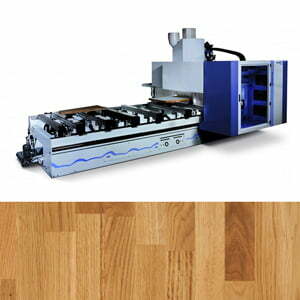 Using our expert knowledge and state-of-the-art machinery we are able to provide cut-outs for hobs of any size. To protect the structure of the worktop, we recommend leaving a minimum of 100mm between the hob aperture and the edge of the surface. 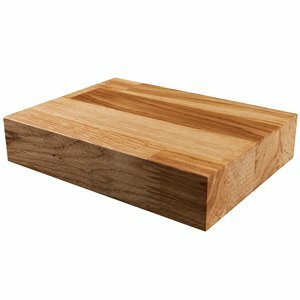 Every kitchen is different, which is why we offer an irregular cut-out option. 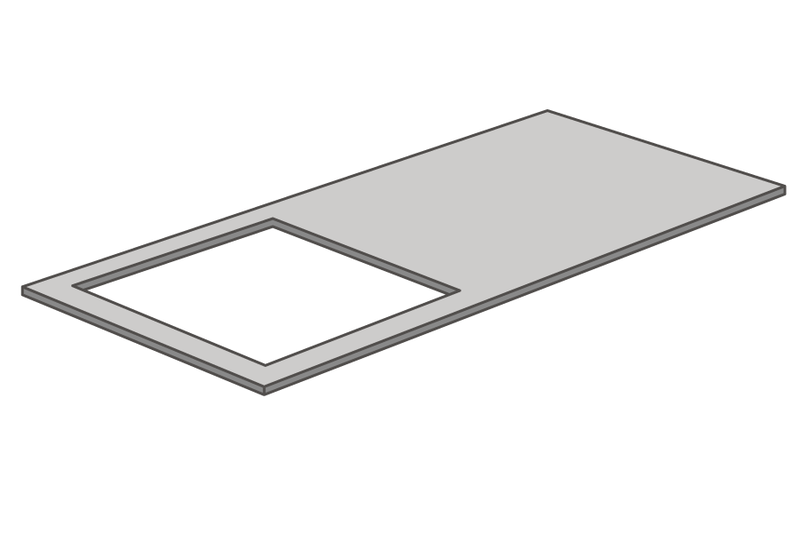 Our irregular cut-outs are suitable to accommodate a variety of kitchen items, including extractor fans, electrical sockets and architectural features such as extruding beams. Applies to cuts under 400mm. Applies to cuts 400mm and over. 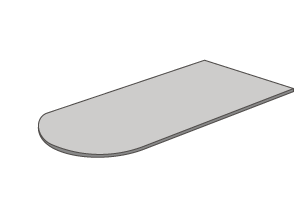 A tapered cut goes diagonally across the work surface. 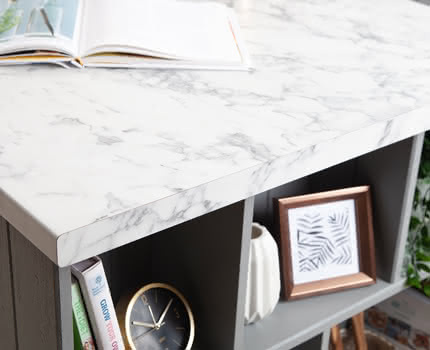 Tapered cuts are an excellent solution for uneven walls and look striking when used to create a feature as part of a breakfast bar or kitchen island. 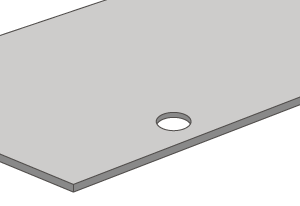 We can provide a tap hole cut-out for any specified measurement. The diameter for a standard tap hole is 35mm but there are a number of different sizes available so please be sure to check the measurements for your specific tap. 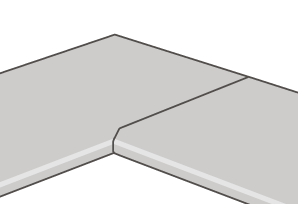 A mason's mitre joint is the best method for joining two solid laminate worktops. This style of mitre joint has pockets machined into the edge of the worktops to be connected, which will need to be filled with standard size 20 biscuits. This technique provides a secure join and wastes less material compared to a traditional 90° mitre joint. A clear 2-part epoxy resin can be used to fix the biscuits in place, securely fasten the surface together and also work as a waterproof sealant. 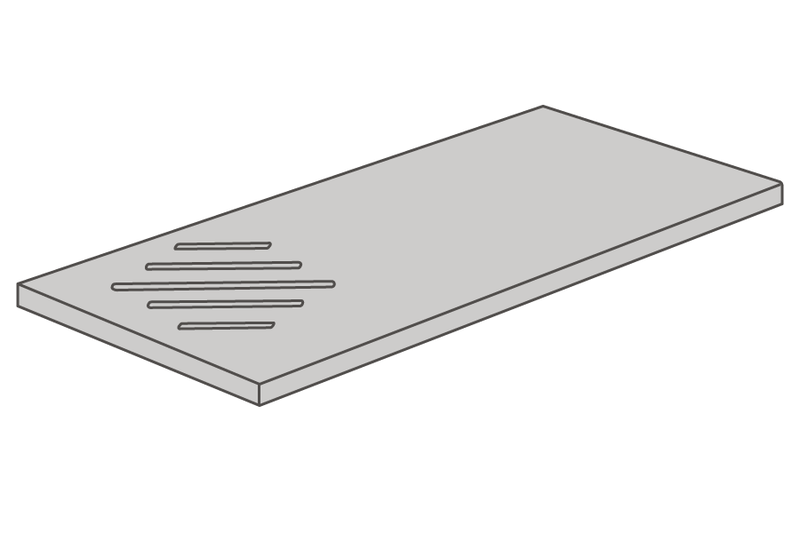 Please note: 10mm will be lost from the 'female' side of the work surface on mitre joints and will need to be added to the connecting 'male' end to ensure your worktop is the correct length. 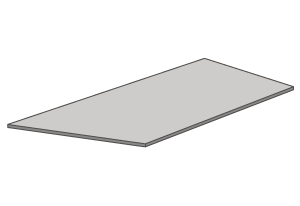 A radius corner is an excellent option for a solid solid laminate worktop that will sit atop curved kitchen cabinets. 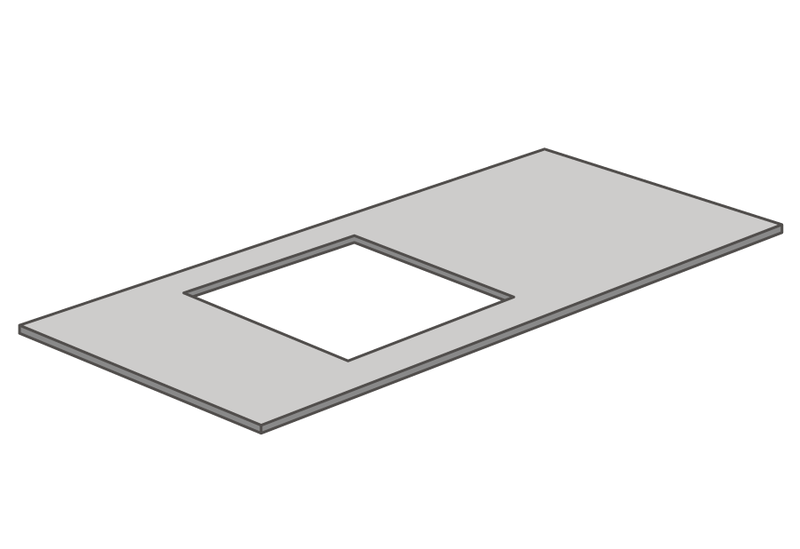 We are able to cut corners to any radius provided, ensuring we can accommodate any requirements. 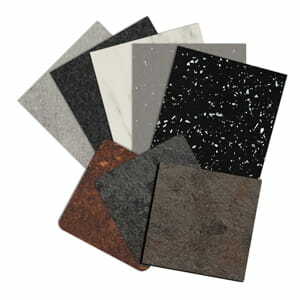 Radius corners are a fantastic way to achieve a softer finish and are a practical choice for those with young children. We can provide ellipse ends of any radius for your solid laminate worktop. Ellipse ends are a stylish, elegant option for any home and look fantastic in contemporary settings. 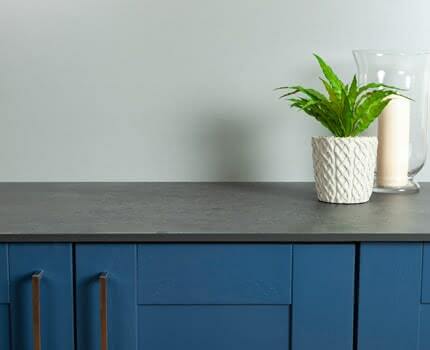 A fantastic option for a breakfast bar, kitchen island or simply for the freestanding end of the worktop over a run of cabinets. 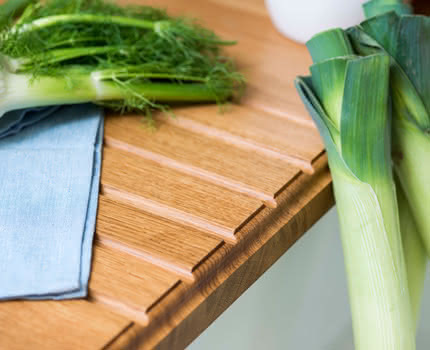 Drainage grooves are the perfect finishing touch for your solid laminate worktop and are recommended for worktops being fitted with an undermounted sink. 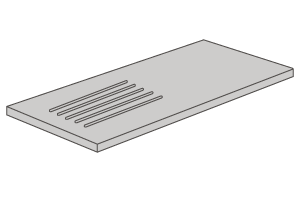 Our drainage grooves are applied in sets of four and are tapered to allow for natural drainage. Price for one set of four. Price for two sets of four. 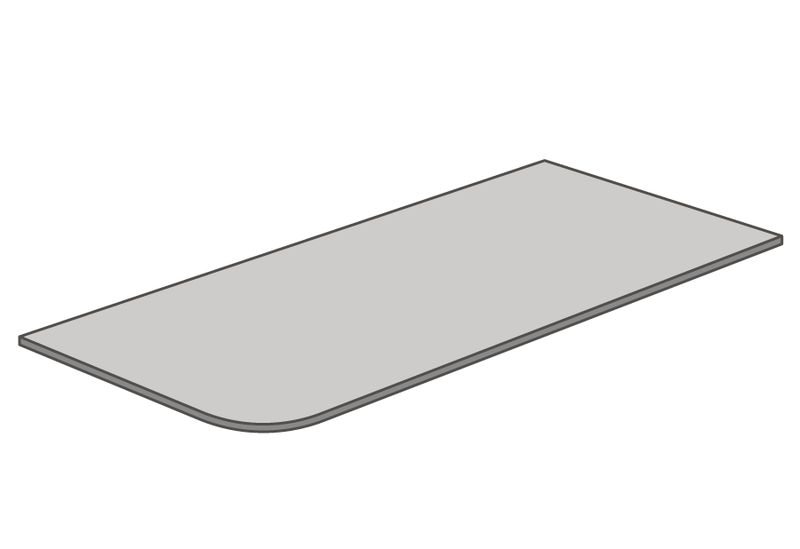 Stainless steel hotrods are a stylish way to protect your worktops from heat damage. 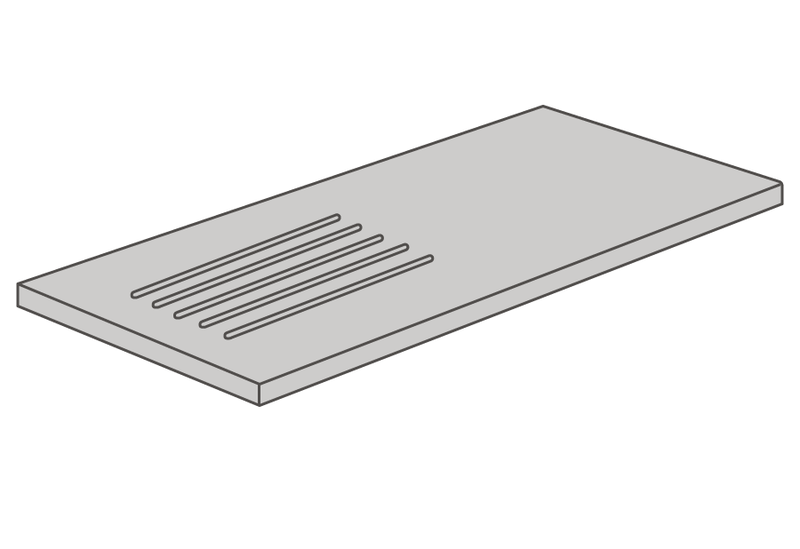 Our fabrication team will router apertures in a choice of formations: either in a 'diamond' or 'linear' shape, ready for the installation of a stainless steel hotrod set (supplied). The hotrods do not need to be fixed into position which can allow for easy cleaning - though you can fix the hotrods in place with a sealant or adhesive if preferred. 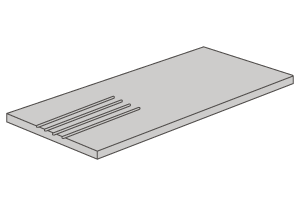 'Diamond' hotrod set (includes 5 stainless steel hotrods: 2 x 100mm, 2 x 200mm, 1 x 300mm). 'Linear' hotrod set (includes 5 x 300mm stainless steel hotrods). Alternatively if you would like a bespoke hotrod formation, please contact us for a quote. 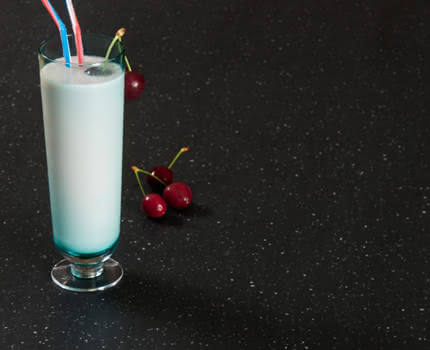 We offer an edge polishing service for our solid laminate worktops to remove any marks that may have been left through other bespoke worktop services. 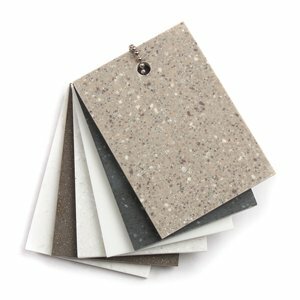 2mm is skimmed from the edge and it is then polished to provide a neat finish and ensure your worktop is ready for installation. 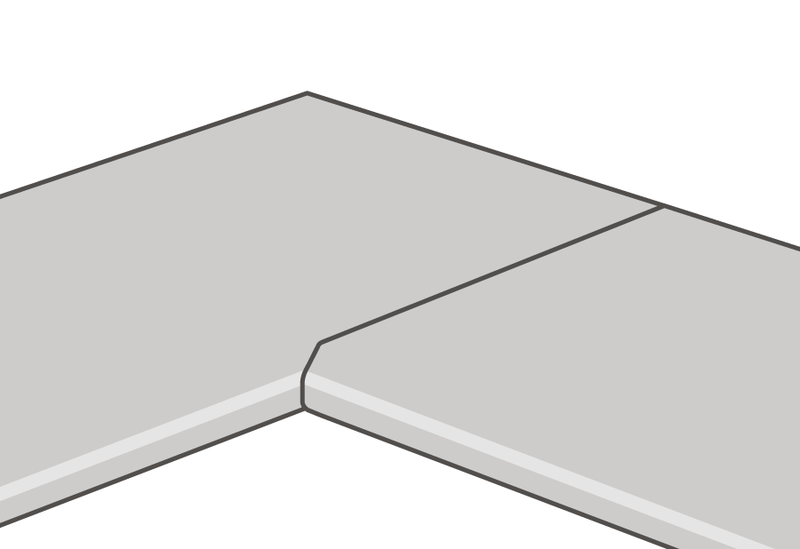 Edge polishing is recommended where worktop edges will be visible once installed. 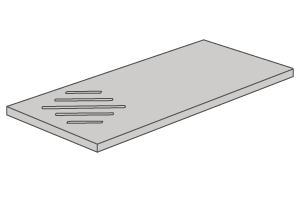 Not all edges are polished as standard, and whilst all edges will be smooth, some may show marks from the manufacturing process.